One of the most common phrases a medical doctor hears on introducing themselves as a member of said profession is probably along the lines of ‘Can you look at this mole for me?’ A specialisation in dermatology aside, most doctors would hesitate to eliminate a skin cancer diagnosis on the spot. Now, however, a company in Miami is working on a device intended to answer these questions for patients. The DermaSensor is a pen-like machine that, as its manufacturer claims, can ‘scan’ a skin lesion and come up with an accurate estimation of its risk of being or becoming cancerous. 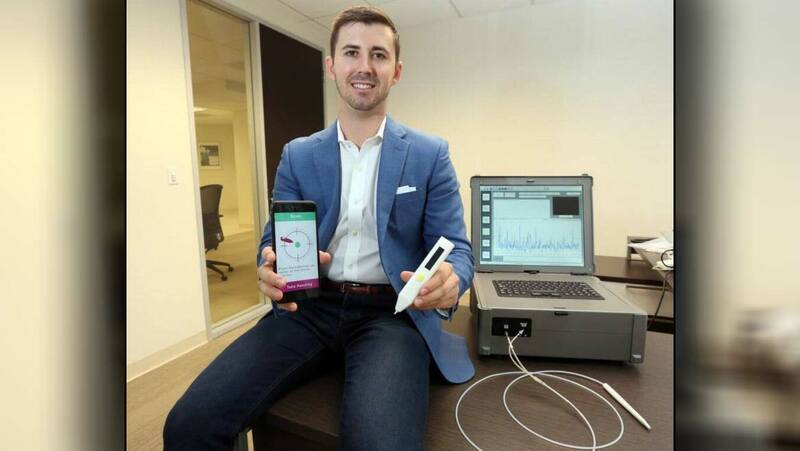 The start-up, led by a Cody Simmons, has spent years refining its flagship product into a portable hand-held device. DermaSensor will initially target clinicians for sales, but also plan to roll them out to consumers eventually. Skin cancer is one of the most common forms of the condition, and is often relatively mild. It is associated with damage to DNA caused by the UV radiation contained in sunlight, and may be avoided by using skin-creams with a high sun protection factor (SPF). However, some subtypes can be more serious; in the United States, a case of melanoma turns fatal every 52 minutes. Early detection and treatment is important in the control of the condition. It is normally detected via visual inspection by a dermatologist, based on characteristics such as the size, shape and abnormal pigment concentrations exhibited by a skin lesion. In addition, biopsies of the lesion in question may be necessary to confirm a diagnosis of skin cancer. However, the makers of DermaSensor assert that it can also be detected using machine learning, namely through computerised scanning of a lesion and the applications of algorithms that arrive at projections of disease risk and severity. The device uses a form of spectroscopy known as elastic scanning spectroscopy (ESS) which turns a lesion’s appearance into a spectrum generated by light that bounces off the melanoma in question. Therefore, the DermaSensor can be described as an optical device intended to assess skin lesions (although the company’s patent only mentions melanoma) for the presence of cancer. The device emits light at a certain number of frequencies, all of which are between 300nm and 950nm in wavelength. It then determines the reflectance of the resulting ESS spectrum, then converts it to a digital form for analysis. According to the U.S. patent application associated with the device, The DermaSensor detects melanoma by converting the ESS of ‘melanoma molecules’ into a digital format and comparing this to the inbuilt database of the spectra associated with other melanoma lesions. This results in an on-screen interface, displayable on a PC, laptop, tablet or mobile phone, that indicates the machine’s diagnosis and may also contain recommendations such as seeing a specialist dermatologist. This screen displays a binary result, according to the patent; a ‘yes’ for positive melanoma detections and a ‘no’ for negative detections. The DermaSensor device, which has been scaled down from something the size of an older desktop PC to a hand-held wand-like device the user can hold against a patient’s skin to ‘scan’ it, is currently in clinical trials processes in the U.S. and Europe. Of these, the European trial is further along; therefore, the DermaSensor may be commercially available here first, presuming it gains approval from the relevant bodies. Even if it does, the results of a DermaSensor scan should not of course be considered a conclusive diagnosis. Rather, it would ideally be part of a risk-assessment in the office of a general practitioner or other doctor. Nevertheless, it may be a useful labour-saving device that can be integrated into routine dermatological screenings for areas in which the risk of melanoma is higher than average. DermaSensor was originally set up in 2009 by an ex-Mako Surgical CEO, although its head executive post has been handed over to Simmons since. It has also attracted millions of dollars in financing. This may be due in part to its location in South Florida, which is a region densely populated with biomedical research institutions, angel investors interested in this sector, teaching hospitals and consulting specialists (dermatologists included). This is why DermaSensor has been based in the region since about 2011, despite the fact that its device was developed at University College London and Boston University. The company is also currently validating their technology in Floridian clinics. A device such as a DermaSensor may be received well, especially in markets that require a large volume of melanoma diagnoses or screening. It was envisioned to facilitate or enhance routine skin-lesion evaluations for populations who could benefit from the increased uptake of dermatological services, according to its original CEO, Dr. Maurice Ferré. However, it should not replace clinical dermatology by any means. In its present form, as described in its patent application (number 20130253335) it compares the digitised ESS of a given skin lesion to those of an apparently broad range of other similar abnormalities. This sounds impressive, but can’t compare to the expertise of a competent human dermatologist. For example, it is not clear how the DermaSensor would assess a case involving a lesion with an atypical appearance, whereas an experienced or skilled doctor may be able to identify it as such at once. On the other hand, it may have a place in routine screening for people to whom it has not occurred to check a large or mis-shapen mole. The DermaSensor, assuming it will reach the ‘marketed’ stage of the clinical evaluation process, is another interesting example of electronically-enhanced medicine that may become commonplace in the future. However, as with most e-health trackers, it does not stand to eliminate human doctors just yet.